Zeniarai Benten Shrine (銭洗弁天) is the second most popular spot in Kamakura. Zeniarai literary means washing money. Most people visit this shrine wash their money and hope the money grow. Originally, this washing money is a part of "Misogi" the cleaning body and soul because money represent the evil side of human. There is no admission fee. No parking. Zeniarai Benten is an 800-year-old shrine and is the second most popular spot in Kamakura, Kanagawa prefecture after Tsurugaoka Hachiman-gu. It was founded in 1185 by Minamoto Yoritomo (1147-1199), the first shogun of the Kamakura government. 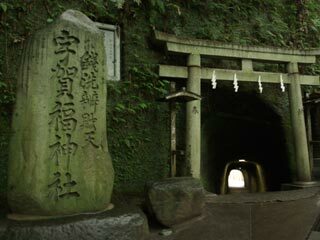 Yoritomo travelled to the spring inside the cave and built a shrine there for the Shinto Kami Ugafukijin. Soon after in what is called Shinbutsu shugo, the fusion of Buddhism and Shinto, Ugafukijin came to be fused with the Buddhist Deva Benzaiten (sarasvati in Sanskrit). Ugafukujin is the Kami of agriculture and Benzaiten is the Buddhist Deva connected with water (sarasvati in Sanskrit means sacred river) which is indispensable to agriculture. Zeniarai Benten is unusual in that it is completely surrounded by high shear rock walls making it completely invisible from the outside. It can only be reached by going through a tunnel which has been carved by hand into the rock wall. The ground of the jinja is irregular which resulted in the buildings being built on different levels. The various buildings within the jinja complex are connected by stairways and walkways. It was long believed that the water here had the power to multiply money it came in contact with. This tradition began in 1257 when Hojo Tokiyori, the fifth regent of the Kamakura government, came here and washed his coins in the spring's water. Today more for fun than greed, many people come here specifically to wash their money in the spring using the baskets and ladles provided.